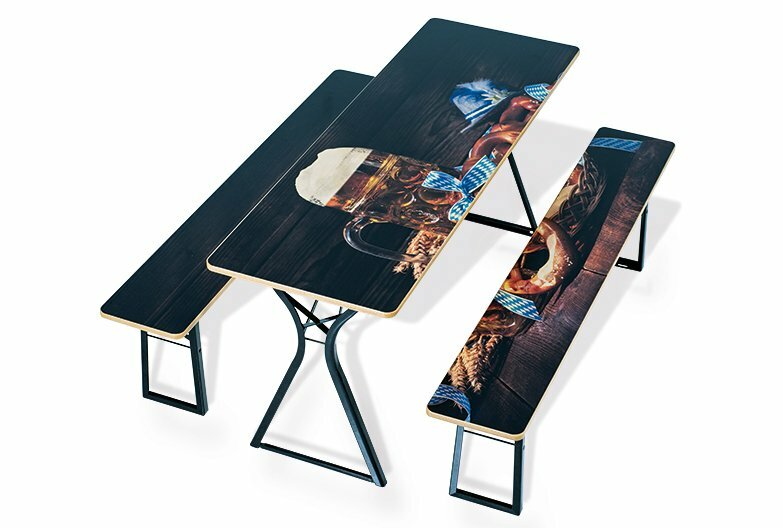 Turn your folding table and bench set into an absolute highlight with our digital printing. Individually printed table and bench sets are always an eye-catcher. Due to the multi-layer varnishing, the printed furniture sets are non-fading, scratch-resistant and wipeable – just as the original RUKU furniture sets. With digital printing, large-scale logos and even whole photographs can be printed onto your folding table and bench set. Due to the multi-layer varnishing, the printed furniture sets are non-fading, scratch-resistant and wipeable – just as the original RUKU furniture sets. The print is being applied after the second layer of varnish and then sealed by a third one. This makes the printed furniture set weatherproof and serves as a protection of the printed graphics. How should your furniture set look like? For a perfect design and best results, our experienced staff will be at your service. A welcome alternative to conventional branding. Your advertising logo will be transformed into a printing screen and then printed on the plate surface. In case of branding, letters and other characters are being burned centrally into the bottom side of our furniture by using a branding iron.